Sacramento Widespread Lavatory Faucet. Solid brass construction with quarter-turn ceramic valves (valve cartridges use 2 ceramic disks that rotate to open and close the valves) for minimized mechanical wear. Includes pop-up drain assembly and 12 inch long flex lines for varying centers 8 - 12 inches. Measurements: 4 7/8 inches Height, 5 inches Spout extension, 2 - 2/1/2 inch base diameters. Flow rate: Approximately 2.2 GPM, tested at 60 PSI. 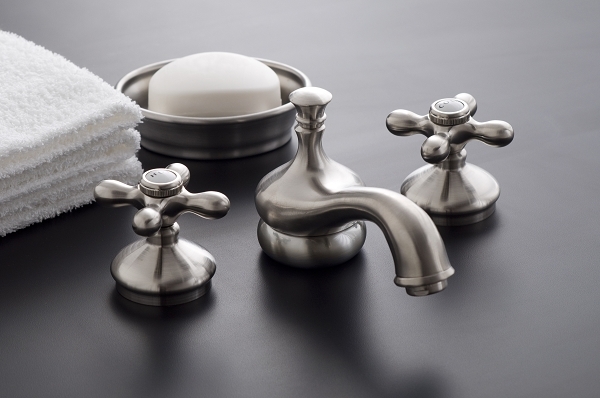 Available in choice of Chrome, Lacquered Brass, Polished Nickel, Matte Nickel (shown in image) or Oil Rubbed Bronze finish. Maximum counter thickness is 1 1/2 inches. Minimum deck hole size needed is 1 1/4 inches.